It's March 1, so that means it's time for New Releases at Oddball Art Stamp Company. Lizzy Love has some great ones today, so make sure you shop the Etsy Shop to see them all, and visit the Oddball Art Co blog to see what the DT has done with them! I colored Image #292 - Sally's Stars with Copic markers, then used a die by Craftin' Desert Divas to cut out the image. The star-shaped card is a design I found in the Silhouette Design Store. I cut it out on my Silhouette Cameo, using Echo Park Dots & Stripes papers. The other paper stars added to the card were also cut out on my Silhouette. The glitter star stickers are from Studio Calico. Do some shopping, use discount code DTJULIE10 to save 10% off of anything in the shop! Then, enter our challenge! February 29 - Leap Day! It's a day worth celebrating! 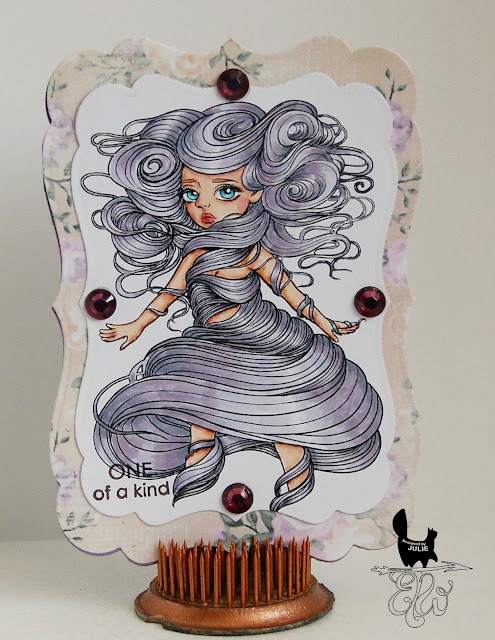 It's also the day for some mid-challenge inspiration at Oddball Art Challenge Blog. The theme for this challenge is "Things We Said Today" (Add a Sentiment). It's an easy one, so I hope you join us! The challenge runs until March 14th. Here's Image #212, 'Zeddy Get Bobo'. I colored Image #212 with Copic markers, then used a variety of dies to make this card. The stitched circle dies are from Lawn Fawn. The other circle dies are from Spellbinders dies. 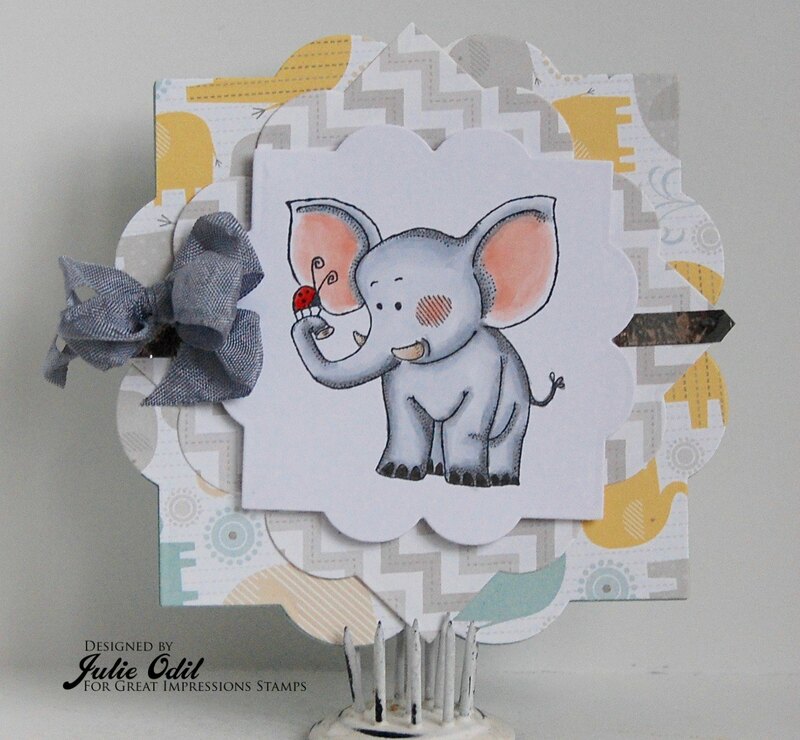 The designer paper, with elephants on it, is from Pixel Scrapper. The sentiment is a clear stamp from Paper Wishes. 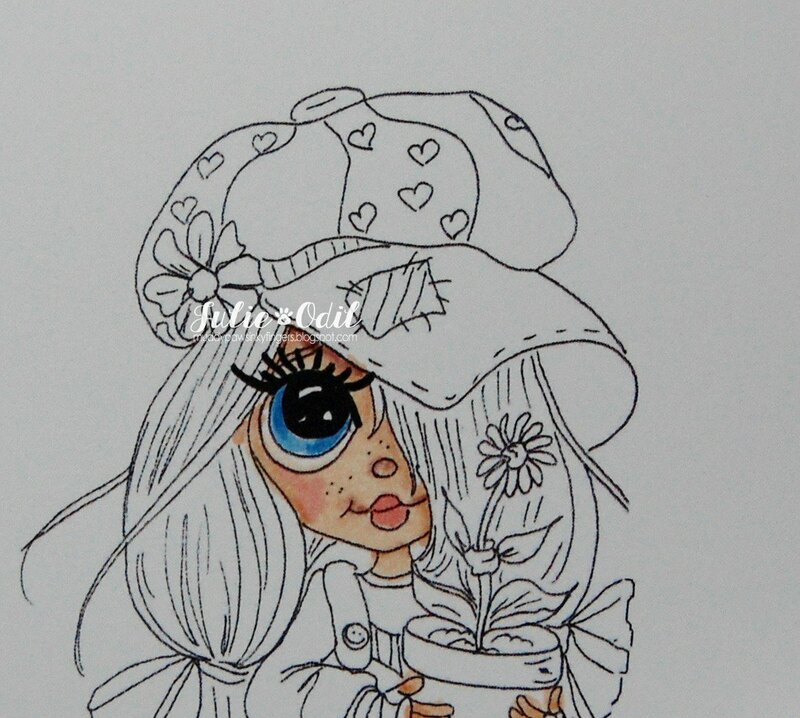 There are digi stamps in the Oddball Art Store that can be used for many occasions. Some have sentiments with them, others allow you to use your imagination. Do some shopping, use discount code DTJULIE10 to save 10% off of anything in the shop! Then, enter our challenge! 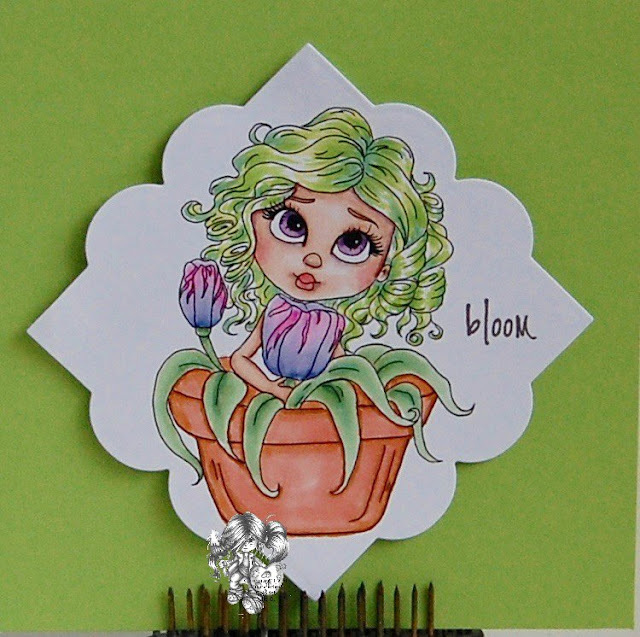 Come back tomorrow, March 1, to see the New Releases from Oddball Art Stamp Co. They'll be available in the Etsy Shop. The design team will showcase what they have done with the New Releases on the Company blog. 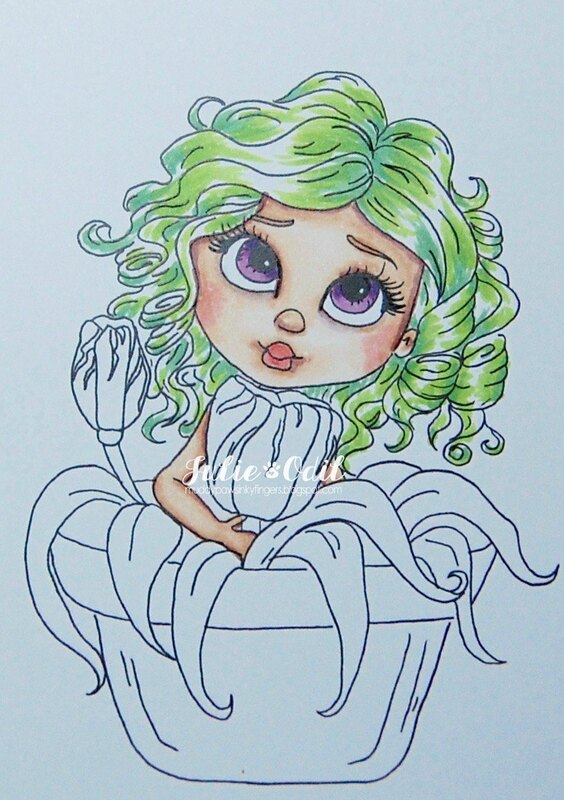 The last Sunday of the month -- that means it's time for the Coloring Without Boundaries design team to showcase their talent with Lacy Sunshine images by the ever-so-talented Heather Valentin. 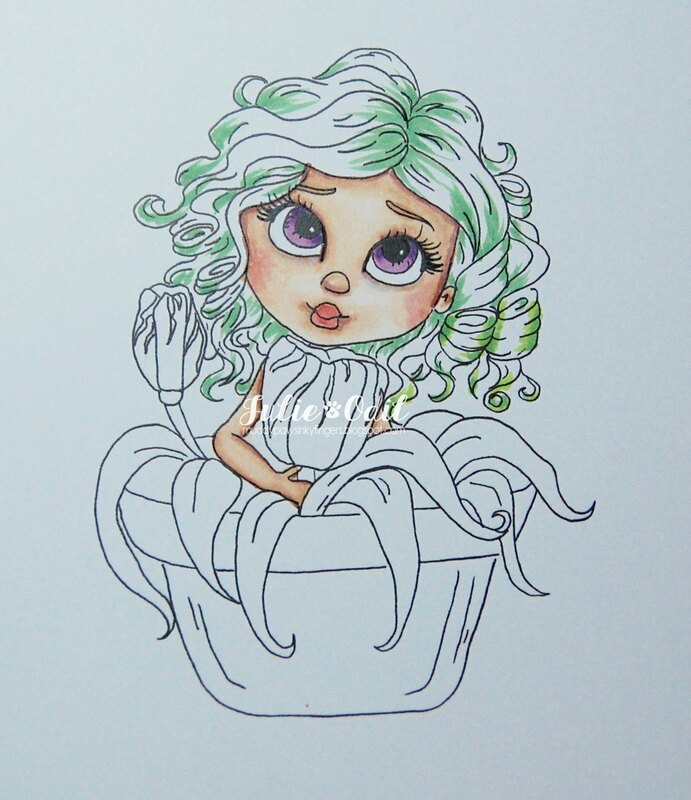 Today, I used Copic markers, and colored up the delightful Tina Tulips Flower Pot Pretty. Hair -- this first pic is the first color, YG45. I generally color light to dark, but with hair, I'm just the opposite, starting dark to light. Then, the finishing touches. YG21 is added, then I go over the hair again with my 2 darkest colors. Designer papers on this card are from Heartfelt Creations. Card stock is by Close To My Heart. I used a variety of Spellbinders dies to make this card. The crinkle ribbon and bow is from 3 Girl JAM. There are some fantastic tutorials on coloring techniques, found on the Coloring Without Boundaries blog each day. Make sure you stop by and visit. Then, visit our Coloring Without Boundaries Facebook group, too. For even more information and inspiration, check out the Lacy Sunshine Color N Craft Facebook Community. Thanks for stopping by today for a visit! I have a very busy blog this week, so come back often! Happy Saturday, everyone! I'm posting today for Great Impressions Stamps. Yea! 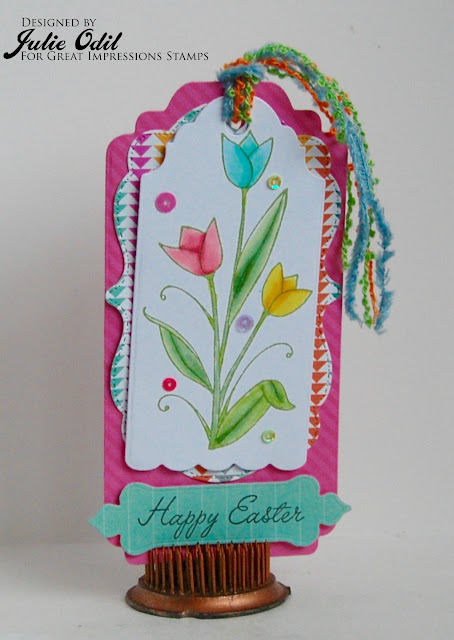 I love making tags, and today I have a particularly bright, spring-like one to share with you, using some beautiful Great Impressions rubber stamps. is Cursive Happy Easter (C430). All papers and fibers for this tag are from Close To My Heart. The sequins are from Craftin' Desert Divas. I've been participating in Gerda Steiner's monthly progressive challenge for quite awhile now. I'm guessing it's been over a year. I'm a huge fan of Gerda Steiner's whimsical images, and I look forward to a new one each month! I colored Jump Rope Bunny with Copic markers. Then, I used a variety of dies (from Craftin' Desert Divas and Lifestyle Crafts) to cut it out and to build the card base and layers. The designer papers are all digital, from Pixel Scrapper. With the sentiment I used, I figure this card can be used for a variety of occasions. Isn't it fun? Every month, I've been participating in The Outlawz Progressive Freebie challenge. I've made it for over a year now. Each month, I think, "this might be the month I miss", but somehow I get something made yet again. This month, I made a tag using Teresa Arsenault's free image. Thank you, Teresa! I colored the image with Copic markers. I was working on the pleats, but I'm not real happy with how they turned out. The tag was created with a variety of dies from Paper Wishes. Papers are all digital, taken out of my stash. Many are from Polkadoodles. The ribbon is from Really Reasonable Ribbon. Outlawz Progressive Freebie Challenge -- Feb. 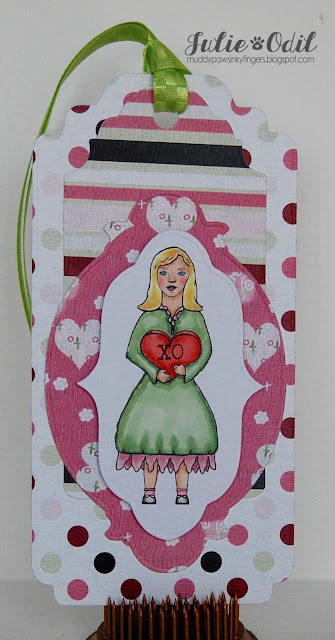 It's Tuesday, and I'm hosting today's challenge on the Crafty Sentiments Challenge Blog. Every Tuesday, there is a new challenge, and this week is one of the most popular ones -- Anything Goes! I like making "Love" cards for my husband all year long. I like to leave them in his lunch bag, on his vanity, under his pillow, in his car -- all kinds of sentimental places so he knows he's special and I love him. Today's card was created just to tell him he's the one for me. 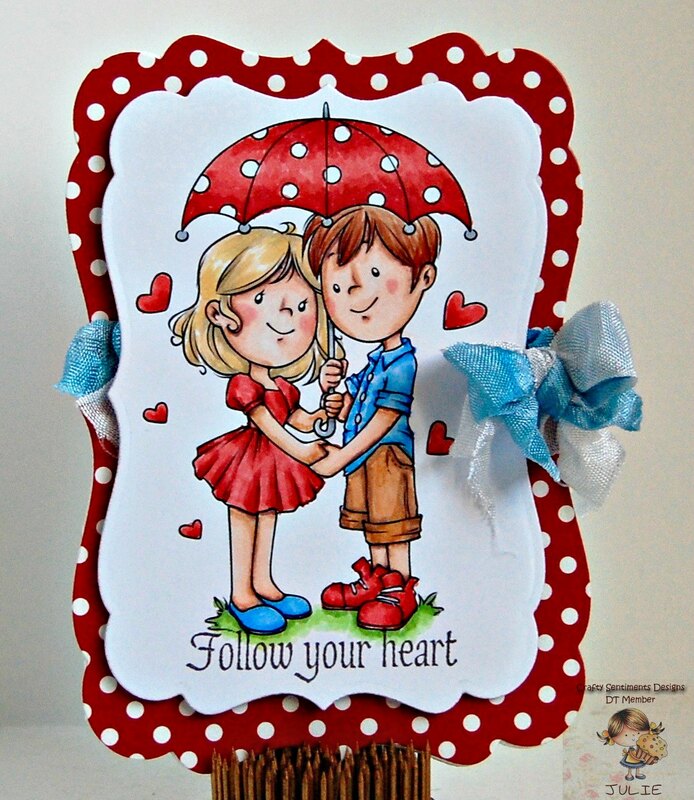 It features Crafty Sentiments Designs rubber stamp, "Hand in Hand". I colored Hand in Hand stamped image with Copic markers, then used 2 sizes of a Spellbinders die to make this card. The crinkle ribbon on this card is from 3 Girl JAM. The sentiment is a stamp from Great Impressions Stamps. The Designer paper is a digital Echo Park -- Dots and Stripes Valentine, printed on my laser printer. I love how the umbrella and background paper match! I so hope you join us this week at Crafty Sentiments Challenge blog. We have such great prizes, and I get to choose the winners next Monday. I'd love to see what you make and have a chance to pick YOU! It's Tuesday. It's Digi Choosday! It's Digi Discount day at Polkadoodles, and it's time for a new challenge! This is a BIG day! Today's challenge theme is "The color Green &/or Nature". 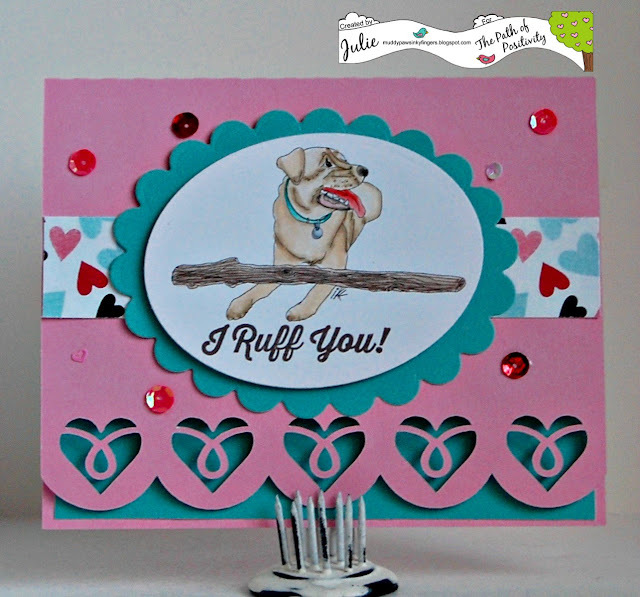 I am having a great time using the new Polkadoodle's Sticks & Bones Collection, so I used it again today to make a card for my BFF. My "Green" themed card uses walk the dinosaur (colored with Copic markers), papers, and a pre-colored sentiment from the Sticks & Bones Collection. It's available in CD or Digital Download. The card base is from the Silhouette Design store. I cut it out on my Silhouette Cameo. I used two Top Dog dies on the image and the sentiment. The ribbon is from 3 Girl JAM. I hope you join us for our Digi Choosday "The color green &/or nature" challenge. It will last for 2 weeks. Our 'Animals & Insects' challenge is still happening for another week, so please join in on that one, too. Hello, fellow craft lovers! 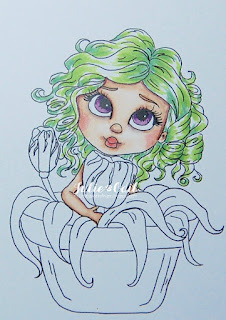 I'm posting today for Coloring Without Boundaries, featuring a Lacy Sunshine image by Heather Valentin. 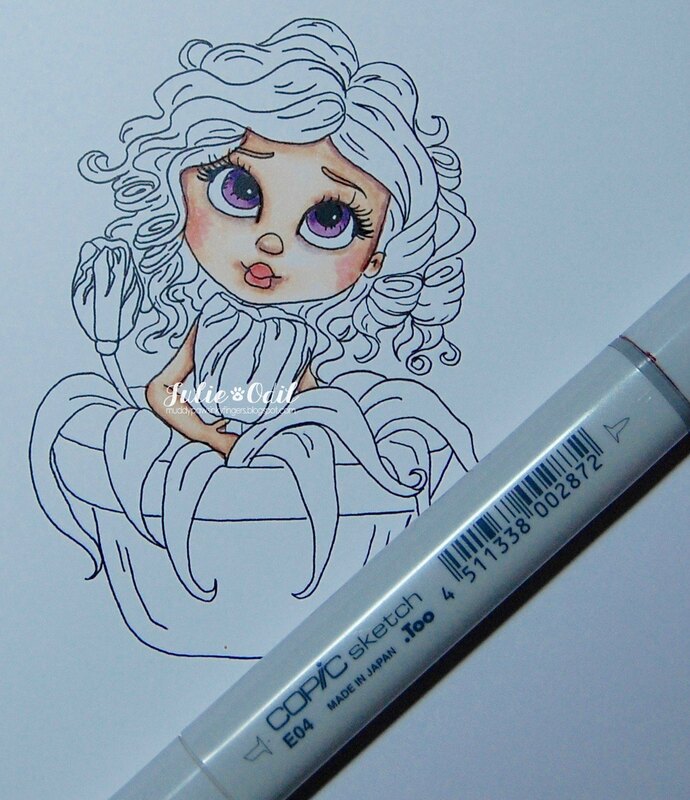 I also have a tutorial to share on how I color eyes with Copic markers. 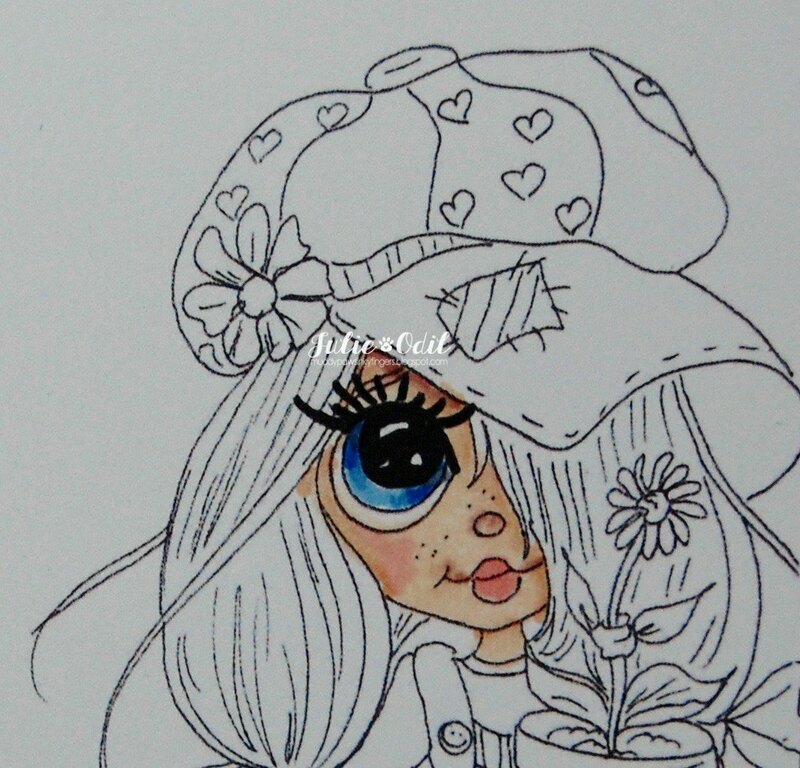 As previously stated, I colored Rory's Tender Loving Care with Copic markers. Add B23, leaving the bottom area with just the first color. Add the 3rd color, in the case B26, concentrating more on the top of the eye, where it naturally appears darker. Add the final color (BV25), as close to the eyelashes as you can. Here's Rory's Tender Loving Care, with coloring complete, and made into a center step card. 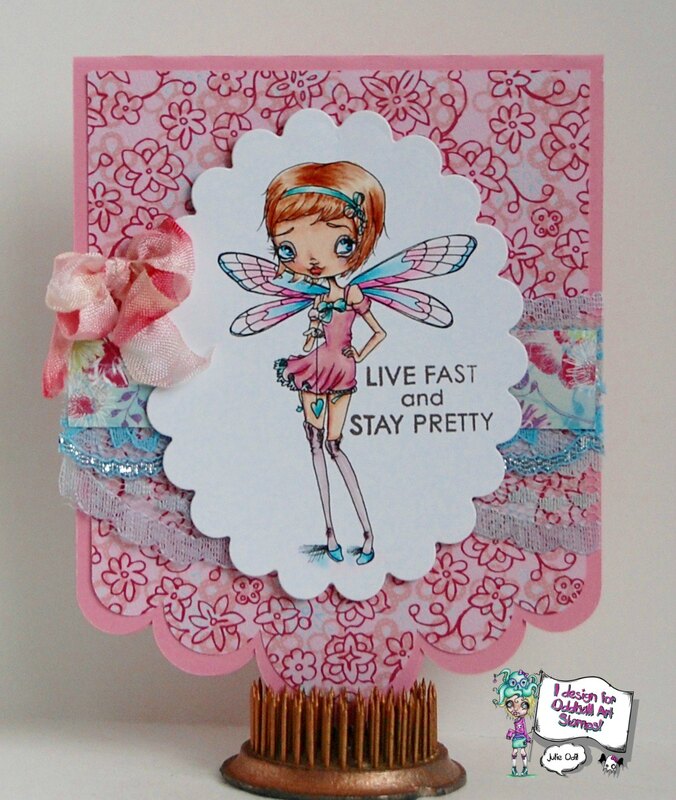 Papers and embellishments are all from the Fancy Pants Wonderful Day 12x12 Collection. 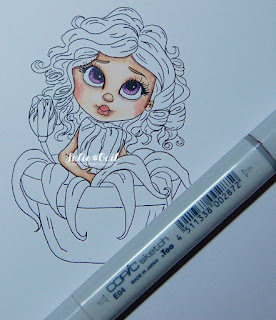 Check out the Coloring Without Boundaries blog each day for wonderful tutorials, coloring, and tips. Then, check out the Coloring Without Boundaries group on Facebook for even more inspiration, support, and ideas. I used the rubber stamp Elephant & Ladybug (F520) on the outside of this card. I colored the image with Copic markers, then used a variety of sizes of the same Spellbinders die set to create the card base and layers. Papers for this card, and the foil tape are from Close To My Heart. The grey ribbon is from 3 Girl JAM. I'll be back next week with more great fun from Great Impressions Stamps. I'm posting today for The Cutting Cafe. 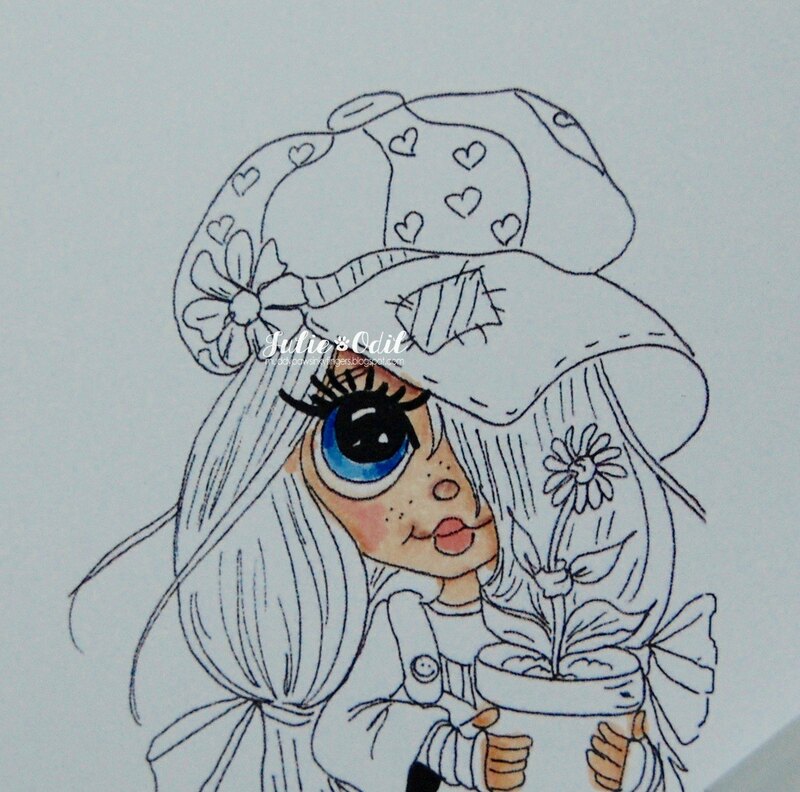 This week is all about flowers. The design team is all using the same set -- Sentiment Stems and Flower Tops Printable Set. It's always nice to think flowers in the middle of winter! I separated the stems in a photo editing program so I could resize them and use them individually, then arranged them how I wanted them, printing them on Close To My Heart card stock. 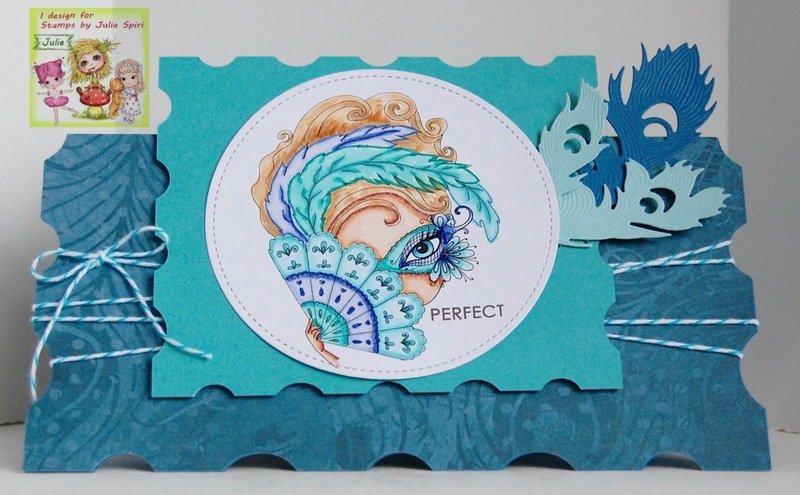 The card base and card layers were created using Spellbinders dies. The flowers are from Prima Marketing. 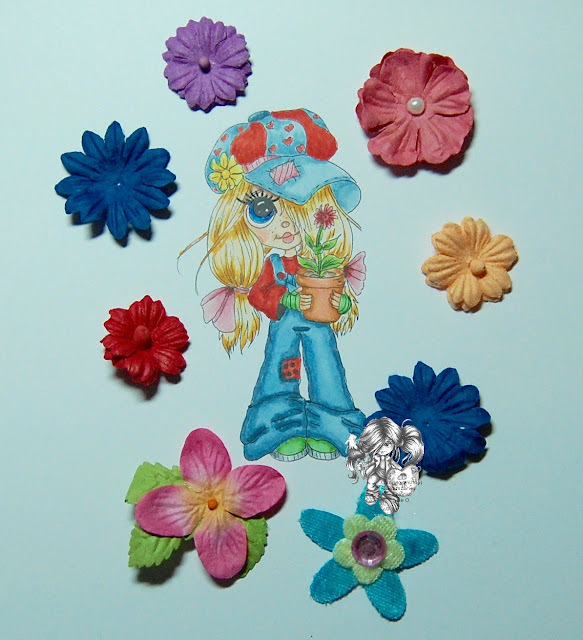 The metal flower sticker is from CTMH. The ribbon is from 3 Girl JAM. Check out The Cutting Cafe for tons more printable and cutting files. There is truly something for every occasion or project you can think of. Also check out the sister site, The Cutting Cafe Shop for clear stamps, papers, confetti, hemp -- all kinds of goodies! Then, visit The Cutting Cafe blog to see what the other design team members have made with the Sentiments and Stems Printable Set. You won't be disappointed! Leave a comment on the blog, and you could win 3 sets of your choice! Last, but not least, there's a great Facebook group full of inspiration too. Check out The Cutting Cafe - Be Inspired Facebook Group. 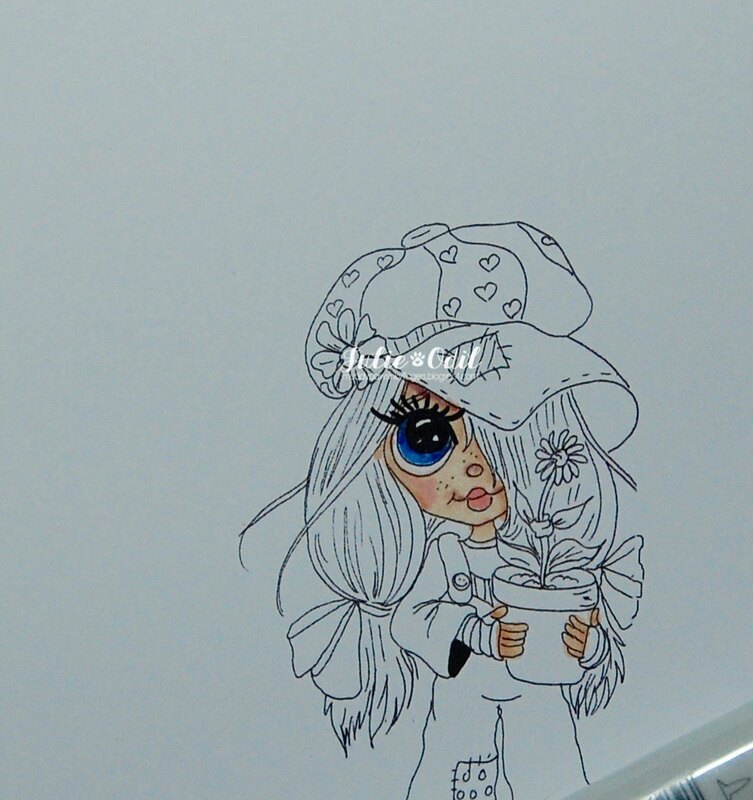 I used Victorian Lady on this, coloring her up in monochromatic violets. Once I had Victorian Lady colored, I used 2 different Die-namics oval stitched dies. The card base is a file I found in the Silhouette Design store, and cut out on my Silhouette Cameo. Designer paper is Heartfelt Creations Delicate Asters Collection. The crinkle ribbon is from 3 Girl JAM. 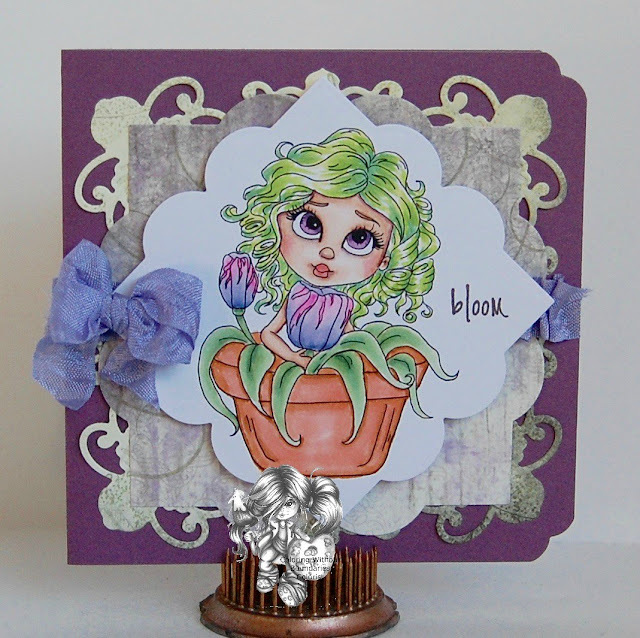 I hope you can join our 'Monochromatic' challenge this next 2 weeks at Star Stampz Challenge Blog. There's great prizes to win, and I'd love to see what you make! It's Thursday, and time for a new challenge on the Julia Spiri Challenge Blog. Challenges are always anything goes with an optional theme. The optional theme for the next 2 weeks is "Venice". Have you seen the last few new releases? They have been fantastic!!! I am using a recently released digi today, called 'The Secrets of Venice'. I colored the Secrets of Venice with Copic markers, then cut her out with a Lawn Fawn round stitched cutting die. The card base was made with a cutting file from The Cutting Cafe, Nesting Frame Shaped Card Set 3. The feathers are Spellbinders dies. The twine is from Timeless Twine. All papers and sentiment are from Close To My Heart. I hope you can join our challenge this next 2 weeks at Julia Spiri Challenge Blog. It's always anything goes with an alternate twist -- Venice. There's some great Venice images in the Julia Spiri Etsy Shop. How fun!! Today is my first post for Sasayaki Glitter Stamps, and I'm so excited! My friend, Naz Smith has started her own digi company, and has invited me along on the journey. This is going to be fun! Today is the start of the Facebook challenge. You will find the Sasayaki Glitter Facebook Group here. Come join us! This month's Facebook Challenge can be found here. They are always Anything Goes, as long as you use a Sasayaki Glitter image. You can find these awesome images in the Etsy Shop here. I Colored Meg's Gift with Copic markers. I used a die set from Top Dog Dies to create the card base and the rest of the card. Come join our Facebook Challenge -- ATG with a Sasayaki Glitter Image! There's great prizes to win, and I can't wait to see what you make! Happy Hump Day, everyone! 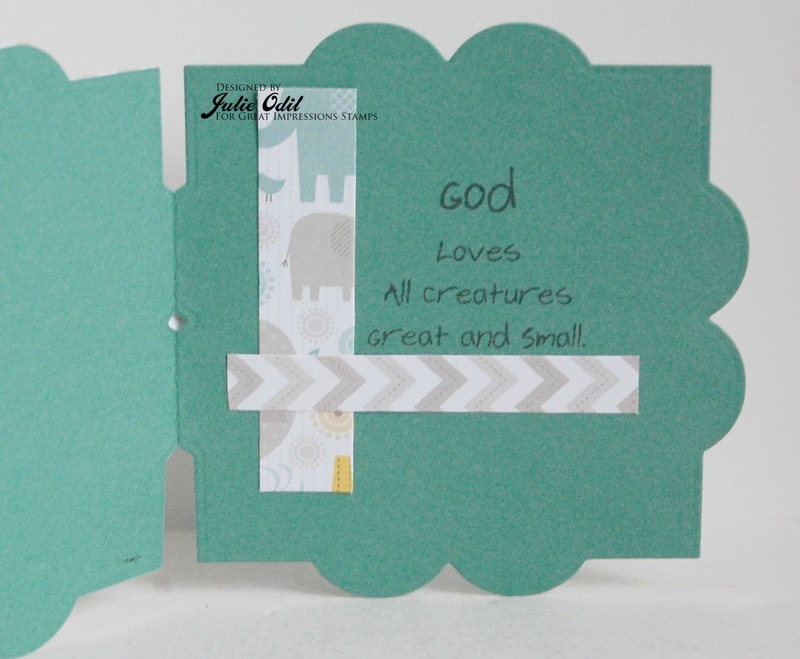 I'm posting today for The Cutting Cafe Shop, using the delightful new set, Animal & Bug Love. I'm loving this set more & more for it's versatility! I stamped the bee and mushroom image from the Animal & Bug Love stamp set on X Press It blending card, and colored it with Copic markers, then fussy cut it. The beehive shaped card is a cutting file from The Cutting Cafe. I computer generated the sentiment, printed it on to card stock, and cut out the tag using a die from Paper Wishes. The designer paper is from Lawn Fawn - Bright Side. The crinkle ribbon is from 3 Girl JAM. The bee metal sticker is from Art C.
Check out the Cutting Cafe Shop to see all the other goodies Regina keeps adding. There's tons of treasures there, and new Easter stamps coming soon! Check out The Cutting Cafe for more cutting files and printables than you can imagine. If you can dream it, you can find it there! There's a great Facebook Group to check out, too -- The Cutting Cafe - Be Inspired. Thanks for checking out my Bee Amazing card today! 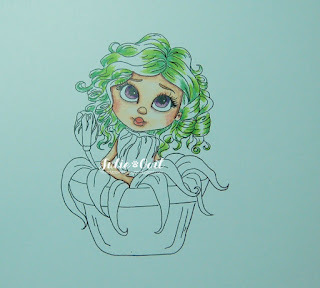 I colored Aurora 'Hair Heaven' with Copic markers. The rest of the card was created using a set of Spellbinders dies. 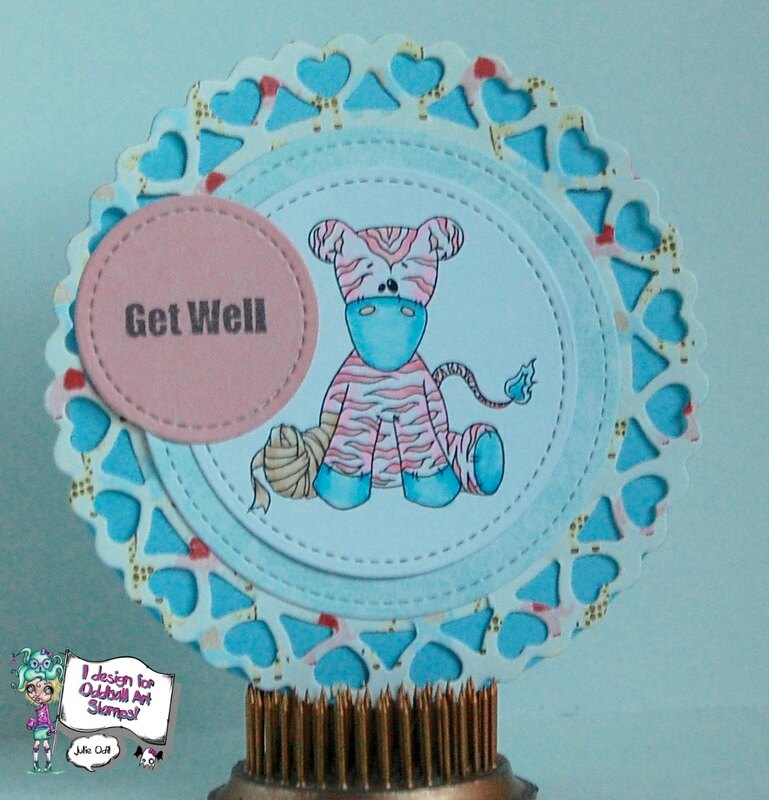 The designer paper is from Heartfelt Creations Delicate Asters Collection. The sentiment is from Close To My Heart. The bling is from my stash. Check out The East Wind's Facebook Group to see what some of the other designers did with this fantastic image. I'd love it if you followed me, also, on Instagram. It's Tuesday, and that means it's Digi Choosday, and that means a discount code for you, good for only 24 hours! And, it means great inspiration and a new challenge over on the Digi Choosday Challenge blog. For the next 2 weeks, the theme is 'Animals & Insects'. Oh! This sounds like the perfect time for the new Polkadoodle's Lily Bug Love collection! I colored Lily Bug Love Heart Balloon with Copic markers. The sentiment and backing papers are all part of the Lily Bug Love full collection, available in CD or digital download. I used a cutting die from Craftin' Desert Divas to cut out Lily Bug Love, and a die from Paper Wishes to cut out the large tag behind her. Fibers are from Close To My Heart. I think Lily Bug Love Heart Balloon will be perfect on a gift or just as a "pick-me-up" gift for someone special. The dies &/or punches challenge is still going on for another week at Digi Choosday, so join in on that one, too. Then, join our 'Animals & Insects' challenge. There's great prizes to win and I want to see what you create! Join our Digi Choosday Crafting group on Facebook, too. It's the 15th of the month, and time for some mid-month inspiration at the Path of Positivity Challenge blog. The challenge theme this month is "Desire". Our sponsors this month are Ike's Art and Scribbles Designs. This time, I worked with a great image from Ike's Art called Labrador Stick. This was my husband's Valentine's Day card from our Golden Retriever, Sophie yesterday. The inside read, "I love you more than a big stick, or a tennis ball, but maybe not more than treats or food, but I really, really do love you." It was signed, Princess Sophie. If you know a dog who likes big sticks, or obsesses over tennis balls, it truly is desire. Life stops when the tennis ball comes out. There is nothing else. One of our former dogs would chase a ball for hours, stopping only when food was offered. That, my friends, is desire, as seen through the eyes of a dog. This card base was cut out on my Silhouette Cameo, using a cutting file I found in the Silhouette Design Store. 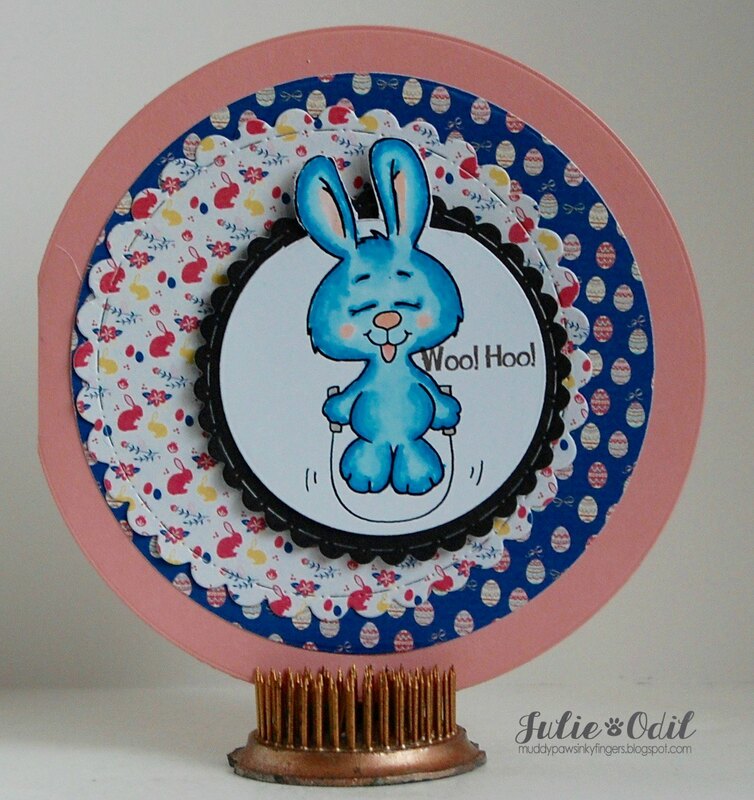 I used several oval Spellbinders dies to cut out and mount the image (colored with Copics). The sentiment is a stamp from Close To My Heart. The sequins are from Craftin' Desert Divas. I hope you can join us this month at Path of Positivity for our theme, Desire. You have until March 8 to link up. We've got great prizes, and I'd love to see what you create! It's New Release day today at Oddball Art Stamps. 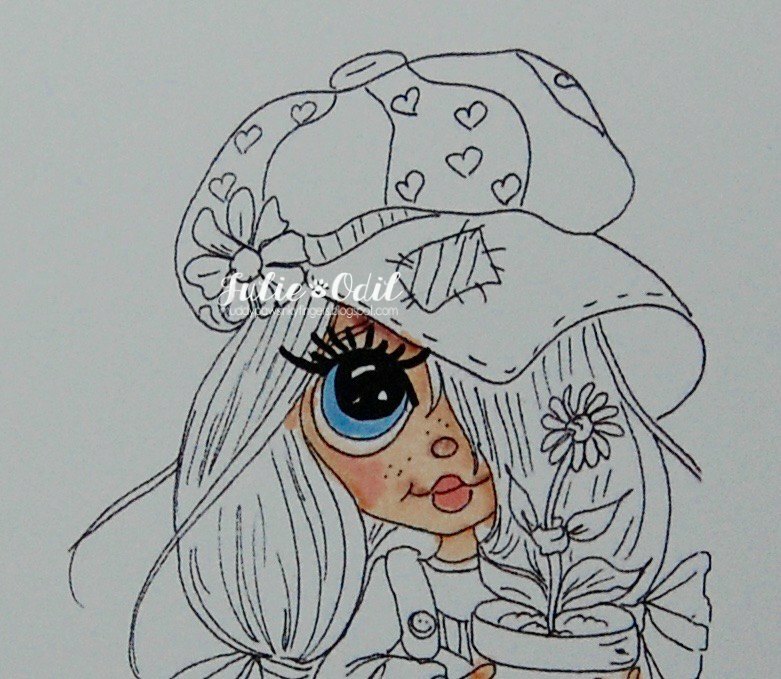 Izzy Love has released some really great images today, so make sure to check the Etsy Store and the Facebook group to see all of them and to see what the Design Team created with them. 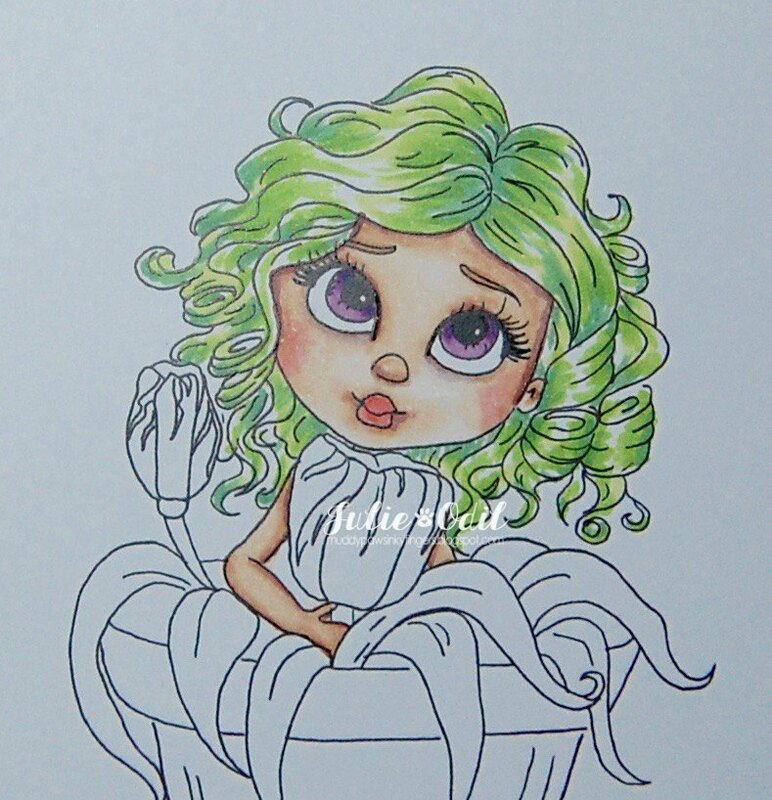 I colored Kiki (image #287) with Copic markers. The sentiment and speech bubble come with the image, but can be separated (as I did). The card base was created with papers from Close To My Heart. The dies are from Craftin' Desert Divas. The enamel dots are also from CTMH. Interested in buying some of today's new releases for yourself? Use discount code DTJULIE10 for 10% off of anything in the Etsy Store. It's the 15th of the month, so that means it's time for a new challenge at Oddball Art Challenge Blog. For the next month, the theme is "Things we Said Today" (add a sentiment). 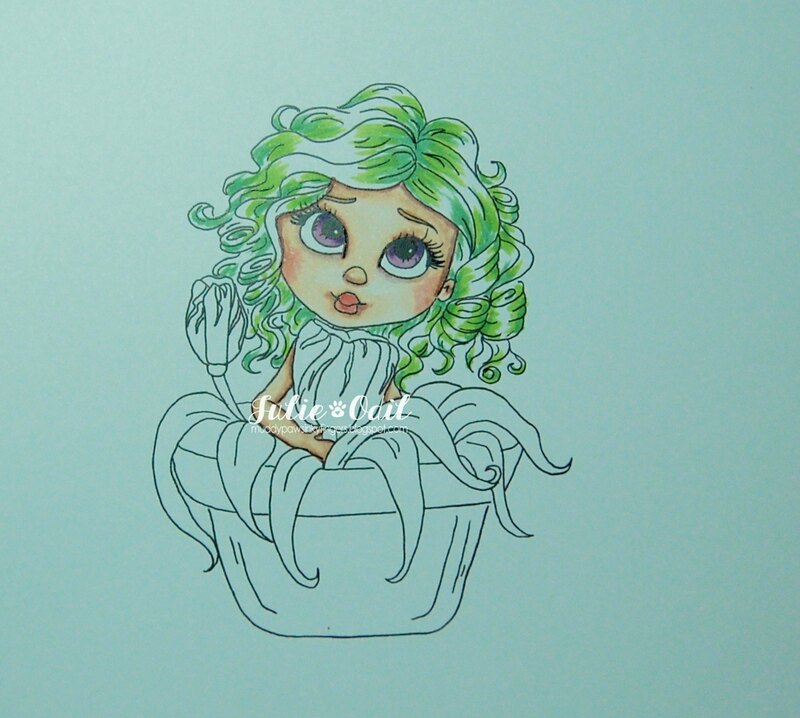 I colored image #164 and colored her with Copic markers. The papers and sentiment are digital, and are from Paper Whimsies. The red hearts were cut with various dies from Lawn Fawn. The glimmer trim is from Close To My Heart. I created the card shape using Spellbinders dies. 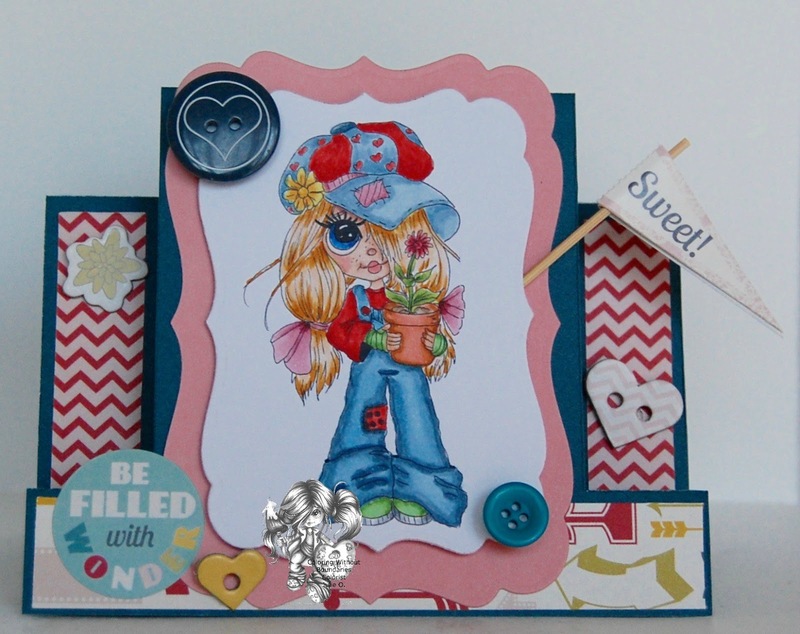 Join us for our 'Add a Sentiment' challenge on the Oddball Art Challenge Blog. You have a whole month! Need an image for the challenge? Use discount code DTJULIE10 for 10% off anything in the Etsy shop. It's Saturday -- my day to post at Great Impressions Stamps! 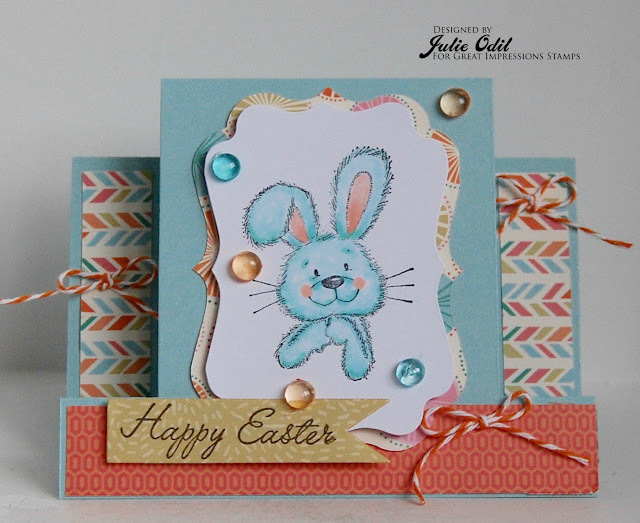 Easter is early this year, so I'm already getting a start on a few Easter cards. 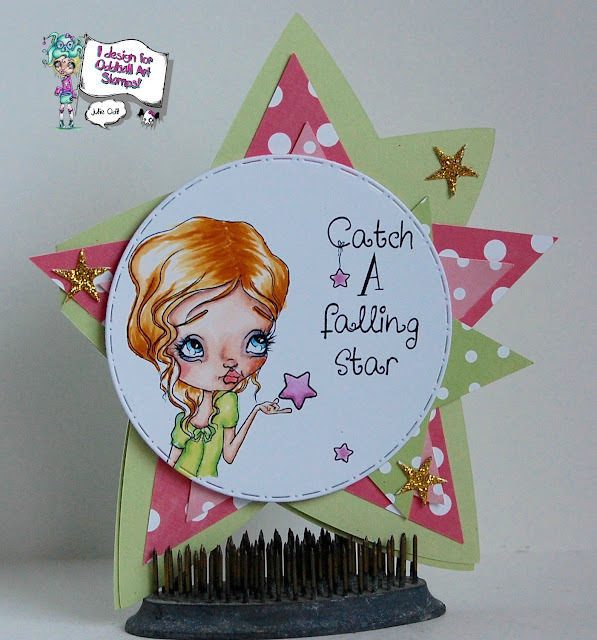 Here's one I made with a super adorable Great Impressions rubber stamp. 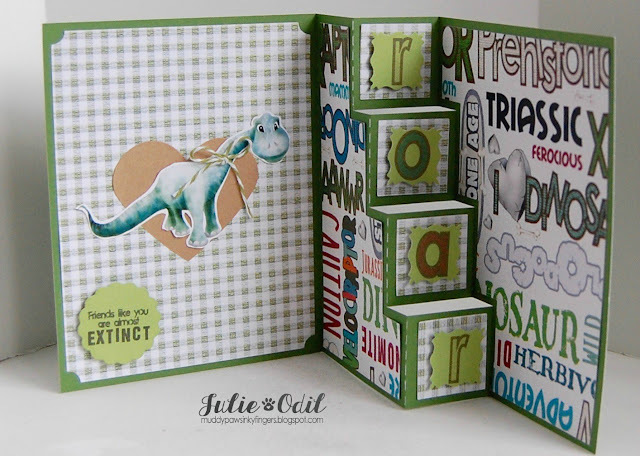 The center step card is a cutting die from Sizzix. Designer papers on this card are from Close To My Heart. There's some Timeless Twine and some Skittles to finish it off. I'll be back next week with more inspiration with Great Impressions Stamps. I can't wait! Hello, and happy Saturday! 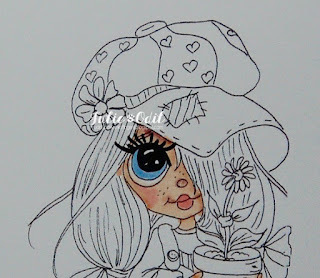 Oddball Art Stamps is sponsoring the Crafty Friends Challenge blog this next weeks, and I'm guest designing, representing Oddball Art Stamps. How fun is that? The theme is "Girlie". Easy and fun, right? Especially using an Oddball Art Stamp Co. image. There are LOTS of girlie ones! 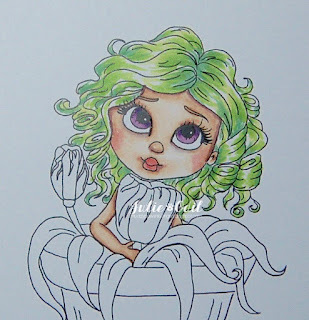 I colored Sai the Fairy (image 167), with Copic markers, using pastel, girlie colors. 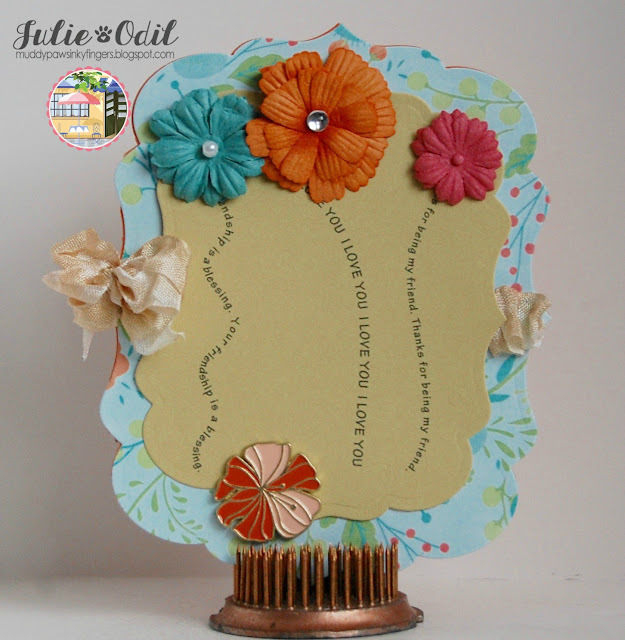 The card base is a cutting file from Pretty Paper, Pretty Ribbons. I used papers from Basic Grey. The ribbon and lace are from 3 Girl JAM. The sentiment is from Close To My Heart. I used a Spellbinders scallop oval die to cut out the image. I hope you can join the fun at Crafty Friends Challenge blog this next 2 weeks, entering the Girlie challenge. There's great prizes to be won -- Oddball Art Stamps! Yea! It's Friday, and it's time for a a new challenge at the Polkadoodles Challenge Blog. Our theme this time is 'Lucky Green'. Aha! Perfect for the new, fun Polkadoodles Sticks and Bones Collection! Available in CD and Digital Download. The papers, alphabet (spelling out 'Roar'), sentiment, and dinosaur are all from the Sticks & Bones collection. I cut the card shape out on my Silhouette Cameo, from a design I found in the Silhouette Design Store. I used a punch on the alphabets, and a die on the sentiment. The heart is a Kraft sticker I found in my stash. There's a bit of Timeless Twine to show off that dinosaur just a bit more. 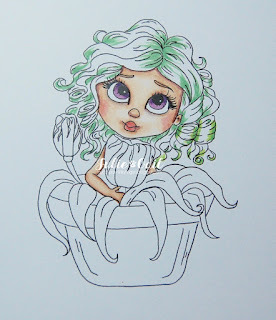 I hope you can join in on our 'Lucky Green' challenge at Polkadoodle's Challenge Blog. It will run for 2 weeks. Please join our Polkadoodles Facebook group, too. There's lots of fun and inspiration happening all the time!